Joseph H. Loewenhardt died on August 7th, 2016 at age 74 while doing what he liked most: soaring in his glider over Pine Nut Mountains, Nevada. On August 7, 2016, about 1216 Pacific daylight time, an experimental AMS Flight D O O Carat A motor glider, N11DY, was substantially damaged when it impacted terrain about 7 nautical miles northeast of Minden-Tahoe Airport (MEV), Minden, Nevada. The private pilot was fatally injured. The motor glider was registered to and operated by the pilot, and the flight was conducted under the provisions of Title 14 Code of Federal Regulations Part 91. Visual meteorological conditions prevailed, and no flight plan was filed for the personal flight, which departed MEV at 1204. Recorded communications from the MEV common traffic advisory frequency (CTAF) revealed a transmission from the accident pilot at 1204, during which he stated that he was departing from runway 34 and would be conducting a "right turn out" after takeoff. About 6 minutes later, the pilot indicated that he was 4 miles east of MEV, climbing through 6,500 ft, and stated that this was the "last call this frequency." No further transmissions were received from the glider. Data obtained from an onboard GPS receiver were consistent with a 1204 departure from runway 34 and a right (eastbound) turn away from the airport. The glider climbed as it proceeded east for about 4 minutes. 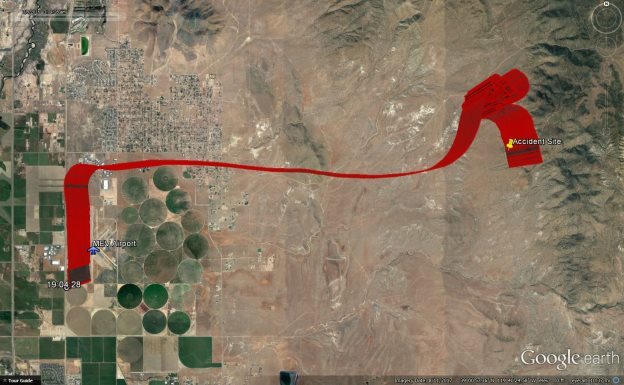 About 1211, the glider turned north-northeast and began a series of right 360° climbing turns from about 7,300 ft GPS altitude to about 8,500 ft GPS altitude, consistent with maneuvering in an area of thermal activity. About 1216, the glider assumed a southerly heading and continued on that heading until the last recorded data point at 1217:18, which was just south of the accident site. The last recorded GPS point was at 1217:03 and showed the glider at 7,841 ft over a location that was nearly coincident with the accident site (see Figure 1). No additional data were recovered. The manufacturer of the GPS indicated that about 1 minute of data could be lost in the device's volatile memory in the event of an abrupt loss of power. 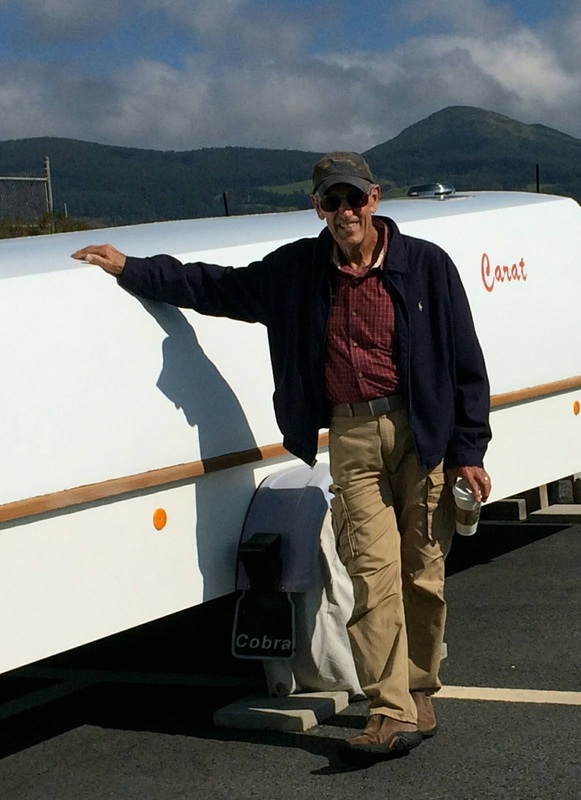 The pilot held a private pilot certificate with ratings for airplane single-engine land and glider. His most recent third-class Federal Aviation Administration (FAA) medical certificate was issued in March 2002 with the limitation that he must have available glasses for near vision. Glider operations do not require an FAA medical certificate. Review of the pilot's logbook indicated that he had about 333 total hours of flight experience of which about 152 hours were in the accident glider. His most recent flight review was completed on September 22, 2015. The pilot had recently relocated to Nevada, and review of his logbook indicated that he had about 10 hours of experience operating in the Minden area. The single-seat, self-launching, composite-construction glider was manufactured in 2003 and registered to the pilot in January 2011. It was equipped with a Sauer S 1800-1-ES1C, 4-cylinder, 54-horsepower engine, an AMS Flight forward-folding propeller, and retractable main landing gear. The most recent condition inspection was completed on December 20, 2015, at a total aircraft time of 456.3 hours. An entry on August 3, 2016, indicated that the glider had accumulated 475 total aircraft hours. The 1230 automated weather observation at MEV included wind from 030° at 4 knots, 10 miles visibility, clear skies, temperature 25°C, dew point -5°C, and an altimeter setting of 30.02 inches of mercury. The density altitude was about 7,300 ft mean sea level (msl). An atmospheric sounding retrieved from a weather balloon launched near Reno, Nevada, about 30 nautical miles north of MEV, about 1600, depicted a dry atmosphere with temperature decreasing steadily with height below 15,000 ft. There were no temperature inversions in this layer. Weather radar depicted no pertinent reflectivity values in the area. The accident site was located on a rocky hillside at an elevation about 6,050 ft msl about 7 nautical miles east-northeast of MEV. Although the glider came to rest in the vicinity of powerlines, there was no apparent indication that the glider contacted the lines before impacting terrain. All major components of the glider were accounted for at the site. There was an odor of fuel and evidence of fuel spillage at the site. The fuselage shell was fractured or breached in several locations, including in the area of the cockpit and aft of the cockpit. Both wings remained attached at their roots and did not exhibit aft crushing damage. Each wing displayed several fractures along its span. The right aileron remained attached to the wing; the left aileron was collocated with the wing but separated. The aft fuselage was separated from the airframe, and the empennage was separated near the root of the vertical stabilizer. The rudder remained attached to the vertical stabilizer. The left side of the horizontal stabilizer and elevator were partially separated from the vertical stabilizer; the right side of the elevator was separated from the horizontal stabilizer; and the horizontal stabilizer was separated from the vertical stabilizer. The magneto and fuel pump switches were both found in the "off" positions. Flight control continuity was established from the cockpit area to the flight controls through breaks in the control rods. The landing gear was retracted. The left wing air brake was stowed. The right wing air brake fairing was separated, and the brake was partially extended. The engine was partially separated from the airframe at its mounts, and the cowling was fracture-separated. The propeller was stowed; one blade remained intact, and the other was separated near the hub. The engine was rotated by hand at the propeller flange, and compression was established on all four cylinders using the thumb method. The top spark plugs were removed from each cylinder and exhibited normal wear. The Washoe County Medical Examiner's Office, Reno, Nevada, performed an autopsy of the pilot. The cause of death was listed as multiple injuries due to blunt force trauma. The FAA Bioaeronautical Sciences Research Laboratory, Oklahoma City, Oklahoma, performed toxicology testing on specimens of the pilot. Testing was negative for carbon monoxide and ethanol. Diltiazem was detected in urine and aortic blood. Diltiazem is a prescription calcium channel blocker primarily used to treat high blood pressure. Use of this medication generally does not present a significant hazard for airmen. On August 7, 2016, at an unknown time, an experimental AMS Flight D O O Carat A motor glider, N11DY, was substantially damaged when it impacted terrain about 7 nautical miles northeast of Minden-Tahoe Airport (MEV), Minden, Nevada. The private pilot was fatally injured. Visual meteorological conditions prevailed, and no flight plan was filed for the personal flight, which departed MEV at 1204 Pacific daylight time. The flight was conducted under the provisions of Title 14 Code of Federal Regulations Part 91. Recorded communications from the common traffic advisory frequency (CTAF) at MEV revealed a transmission from the accident pilot at 1204, during which he stated he was departing from runway 34 and would be conducting a "right turn out" after takeoff. About 6 minutes later, the pilot indicated that he was 4 miles east of MEV and climbing. No further transmissions were received from the glider. The glider came to rest on a rocky hillside at an elevation of about 6,050 feet on a heading of about 340 degrees magnetic. All major components of the glider were accounted for at the site. The propeller was stowed, and the magneto and fuel pump switches were each found in the "off" position. The landing gear was retracted. The engine was rotated by hand at the propeller flange, and cylinder compression was established. The 1230 automated weather observation at MEV included wind from 030 at 4 knots, 10 miles visibility, clear skies, temperature 25 degrees C, dew point -5 degrees C, and an altimeter setting of 30.02 inches of mercury.